Jolly Rancher is a very popular and recognized brand though out The United States.This product provide premium "Jolly Rancher" candy taste profile which brings back their childhood memories. 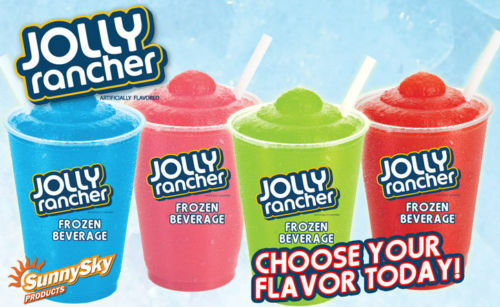 Jolly Rancher very popular Frozen Beverage brand such as Blue raspberry, Fruit Punch, Strawberry, Watermelon, Mixing jugs and Sour Green Apple. These exciting new beverages are boldly flavored, less sweet, a little tart and intensely colored. Available for frozen, carbonated and non-carbonated applications, the syrups are packaged in shelf stable bags with a one-year shelf life.